For this fortnight Patter has given us the word "Follow" for our challenge. Once I read the word and Patter's devotional thoughts an old hymn with the Chorus that I have shared on my art came into my mind. I am not a musical person but do love to sing and the words from the hymns and scripture songs are good to have in our minds to remind us of Bible truths. My Bible verse choice is because my Ken is about to retire ( 4 weeks to go ) and I will follow in July so we can use our newly purchased caravan to go out and become "Fishers of Men" - by travelling for pleasure and being a witness where we are and also travelling to help in outback Churches or Missions. I have added a blended photo our granddaughter, Imogen when she was littler, reaching up for her Poppa's hand as it makes me think of how we need to reach out and hold onto Jesus to follow His leading. The digital kit I used is called "Beach Bungalow" by Deanna Patterson. Oh wow I remember this. We used to sing it at our church in the early 90's everytime someone came up from the batismal ... lets just say it is well and truly stuck in my head now. I love it when artistic design unites with real-life photos. It's time for me to get back into my digital scrapbooking . . . Congratulations on your upcoming retirement. My husband retired at the end of January. We haven't enjoyed the full effects because we were practically snowbound the first month (we live in Delaware, a mid-Atlantic state in the U.S). I am self-employed and worked from home, so that's another adventure in itself. I especially like the scriptures you selected. Great job. Another gorgeous page and I LOVE that photo you used of your husband and grand daughter! 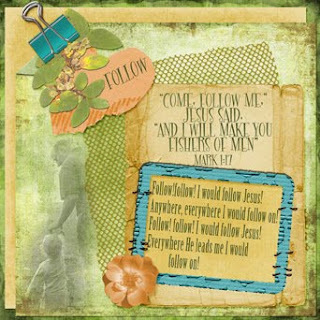 If only we would follow Jesus as easily as our little ones follow us!